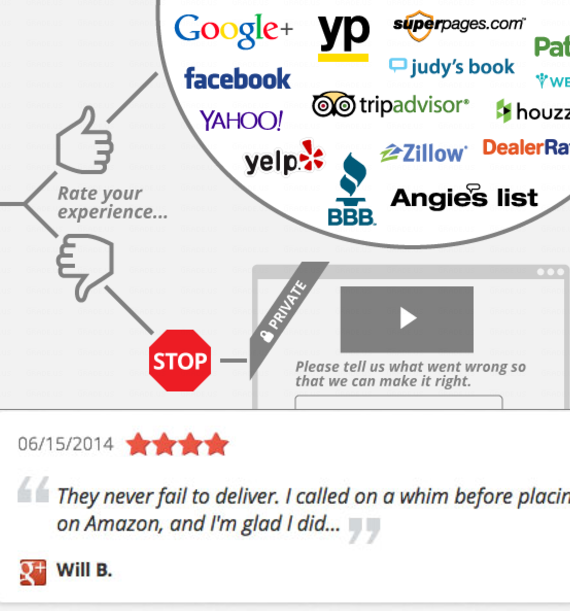 Take control of Online Reviews! First off, let’s say what we all know and understand. An upset customer is much more likely to write an online review about their negative experience. The client that is pleased with your service will often provide you with a thank you and truly appreciate the service or product you provided. Unfortunately, once the transaction process is completed as they are, on to other things they go. Most of us aren’t too surprised by this. I mean after all, it is simple human nature. When we are upset, we are more likely to vent our frustrations. When life is good and the day couldn’t be going any better, we tend to enjoy in our own way and keep the day going. Reviews submitted through our online review funnel will be placed on your website, which puts you in control of what reviews are streamed allowing you to control which reviews go public and which stay private. This provides you a great opportunity to amplify 4 or 5 star reviews. Show consumers you care about their satisfaction and make that first impression count! Our review platform can not only help you stay a step above your competition by capturing and initiating more positive reviews, but we also help prevent the negative reviews by giving the business owner the opportunity to satisfy unhappy customers. We do this by putting you in the position to potentially uncover an unhappy client before they voice their dissatisfaction all across the internet. No business is perfect and having the ability to right a potential wrong or miscommunication of some sort is an opportunity we think no business would ever pass up. Send personalized messages to customers requesting their feedback. Increase positive customer reviews by guiding happy customers through the process of completing a review. Prevent negative reviews by steering disgruntled customers away from the Internet into immediate contact with a manager or owner. Receive an alert the moment a review is submitted. See reviews in the reviews tab of Reputation Management. Printed review cards available to direct a happy customer.